A Sacramento is being held at the Sacramento County Jail after he allegedly violated a restraining order and led police on an eight mile pursuit. 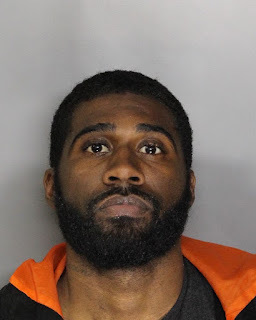 Shortly after 11 p.m. Elk Grove Police responded to the 7000 block of Elk Grove Boulevard after receiving reports that Julaney D. Perkins (photo above), 25, of Sacramento had allegedly violated a restraining order. When officers arrived, Perkins fled on foot and drove away from the location in his vehicle. Perkins then led officers on the pursuit that ended on the 7500 block of 21st Street in Sacramento after an officer utilized the Pursuit Intervention Technique that disabled the vehicle. Perkins again fled on foot and was apprehended a short distance away. Perkins is facing two felony and four misdemeanor charges and is not eligible for bail. Arraignment is scheduled for Friday, May 5.